“Poetry is the music of the soul, and, above all, of great and feeling souls." 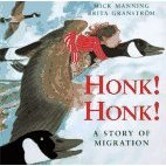 Travel on a magical journey with a wild goose and her flock as they migrate to their nesting grounds in the distant, snowy north. wings waving to people far below.